There is no need to bring politics in taking up development works in their respective constituency’s. All the elected representatives should work for the betterment of people, said district in charge minister Ramesh Jarkiholi to the MLAs and the president’s of the urban local bodies. He was speaking at the meeting to give approvals to Nagarotthana kriya Yojane at Deputy commissioner’s office. 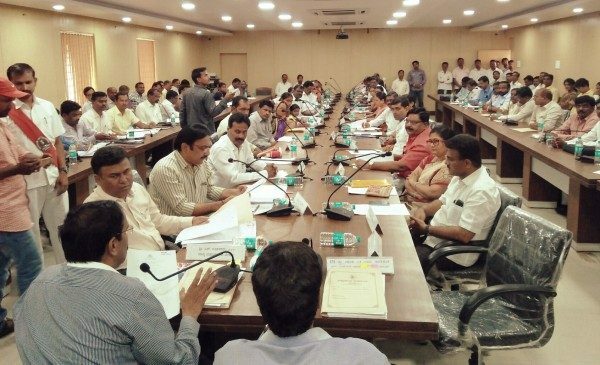 District minister Ramesh Jarkiholi urged in meeting to set aside the political differences aside during development works and approved the lake projects. Nippani MLA Shashikala Jolle complained against chief officer for not bringing the action Plan of lake work in Borgaon into her notice. The officer was answer less in the meeting. Kudachi MLA P Rajeev urged district minster that action should be taken against such officer for bringing subjects in meeting without taking signature of MLA. Nippani municipal President Vilas Gadiwaddar backed officer by intervening. He said that the subject directly brought in this meeting as the MLA and other representatives would be present in meeting.